Visiting my good friend Rob and his family in LA turned out to be good timing to see this revue at the Rubicon Theatre in Ventura CA. 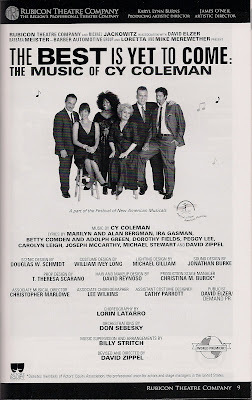 I saw the show The Best Is Yet To Come: Music of Cy Coleman on Sunday (7.26) matinee. 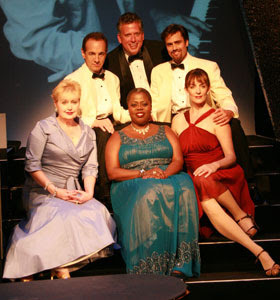 It stars David Burnham, Tom Lowe (understudy of Jason Graae), Sally Mayes, Julia Murney, Billy Stritch and Lillias White. Housed in Rubicon Theatre's intimate space (which used to be an old church), the show is a fast paced music extravaganza from the great Cy Coleman. Accompanied by an onstage 8 piece swing band with Billy Stritch at the piano, the show zips through song after song without any dialogue but beautifully interpreted by these 6 artists. In fact, the show zips through so fast you wanted more at the end or at least have it start over. It was really entertaining to have these artists equally showcased in a the set list comprised with solos, duets, trios, quartets and some choreography. Lillias White was hilarious and a show stopper with her Never Met a Man/Oldest Profession. Sally Mayes' elegant voice wrought out the drama in With Every Breath I Take while David Burnham's soaring tenor voice elicited "woos!" from the audience. When not singing his solos, his scenes were mostly with Julia Murney and they have great chemistry. Their Only The Rest of My Life was stirring. Tom Lowe (who could pass for Norbert Leo Butz' brother.....and I didn't know he was on American Idol 6 until this post!) has a wonderful big bold voice yet reminds you of Frank Sinatra while he was singing Witchcraft. I really liked him. He was amusing with Sally Mayes in the very funny The Measure of Love. Julia Murney sang the heartbreaking Come Summer with simplicity it was exquisite. But among her songs, the highlight for me is the playful song and dance number Hey, Look Me Over/The Doodling Song. Lorin Latarro (choreographer) was able to showcase Julia Murney's dance strengths in a number with a hat prop (see 2nd photo above), fast turns, high kicks and even lifts courtesy of the back up dancers, David Burnham and Tom Lowe. She has lightness to her steps and grace with her movements that make this number so delightful to see. I was pleasantly surprised since her previous shows (well, at least those that I have seen, Evita included) have not featured her dance skills this extensively. A full song and dance routine with her sweeping through all those dance steps while singing high notes! She's also actually doing double duty in this show being that she IS also the "dance captain". I teased her about it when I saw her at the stage door afterwards. To which she just laughed and answered with a self-deprecating "there really wasn't much to be dance captain for". Having said all that, the star of this show is still the beautiful music of Mr. Cy Coleman. The revue is only until this coming Sunday, August 2. I'm not sure if it has plans to move to NYC but it sure would be a great Off-Broadway show. Yup! You are 100% right. I saw it the week before and it was worth driving down from SF to see. I thought "Only The Rest of My Life" was a highlight of the show. (Lilias' "Oldest Profession being just mind blowingly wonderful.) Going back on Sunday, I liked is so much. Thanks for the wonderful review! You were spot on. I saw the show Friday night and really enjoyed it. It's me again. I just looked through your archives and wanted to let you kids know that you're doing a great job reviewing the shows that you see. Keep them coming!